In our last issue, we reported that the stalemate between the CWU and the City Council had the prospects of ending off on a good note after relations between the two entities had soured due to the Council’s decision to privatize their Security Department, leading to the ultimate redundancy of about 26 security officers who were employed with CitCo. While the agreements that were made during this week between Belize City mayor Darrell Bradley and CWU president, Audrey Matura Shepherd, existed in principle, they were not “etched in stone”, and consequently, the workers were up in arms once again today, as they railed and vented outside City Hall this afternoon, anxiously awaiting their much-needed final cheques, which the workers asserted not only came late, but did not match up to the figures that they were initially promised. This evening, the employees – who were visibly upset – stood in wait outside the offices of City Hall, clamoring because they contended that their severance payments were supposed to be ready at 2:00 p.m., and this did not happen as promised, and some of the irritated workers began to lose their patience. One of the main reasons for their ire was financial and family obligations, as those who spoke to the media made it clear that they have bills to pay and children to feed, and the pay clerks inside the council’s offices were telling them that their cheques still weren’t ready – almost an hour and a half after the cheques were supposed to have been delivered. When the security officers were finally paid at 4:00 p.m., they found themselves in a bind, since most banks were already closed at that time; therefore, some of them went scrambling to the pawn shops to see if they could cash their cheques. The CWU’s president –who came to the scene afterwards – told reporters that that’s not what the union expected, and that she was stunned by what happened. She also mentioned that the meeting that was scheduled to take place between the union, the Mayor and the head of the new security firm, Hiram Longsworth – to discuss the terms under which the 20 workers were to have been transitioned – did not come to pass, and that the workers still have not gotten new offer letters with the new terms. 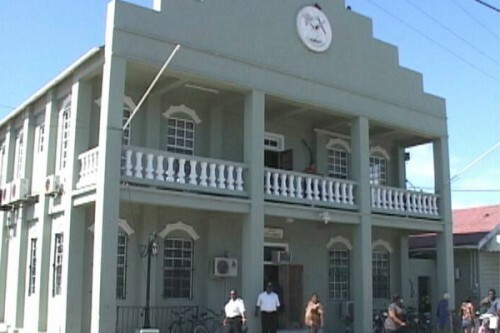 Today was the final day of employment at the City Council for those workers since their posts were declared redundant, and the CWU believed that it had scored a victory on behalf of the workers after a consistent series of negotiations with the Belize City Council and the Labour Commissioner resulted in a resolution by the Council to facilitate the transition of 20 of the 26 security workers to CitCo’s new privately contracted security firm, known as Rangers Security. The others were promised considerable ‘compassion packages’ to help with their daily expenses while they search for new employment. The general consensus, at that time, was positive for the most part, and the plan was going smoothly until today, when it was time for CitCo to “cough up the cheese”, so to speak. At the end of the day, some of the workers were instructed to return for their cheques next week – which they admitted that they will have to do, since they don’t have a choice.